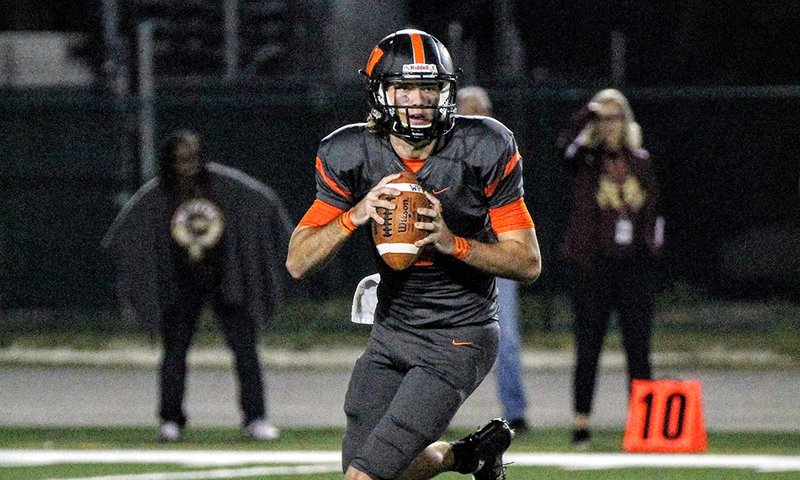 WINTER PARK, Fla. — A 34-yard field goal by Tom Daly and an interception with less than two minutes to play by Jonathan Griffin sealed the 30-21 victory for the Winter Park Wildcats over Wekiva in a Class 8A quarterfinal at Showalter Field. On September 23, the Mustangs won 35-7 over the Wildcats, but this time it was a different story. The defense stepped up and quarterback Cameron Lagree made the right plays when his team needed him the most. Lagree led his team in Wekiva territory and launched a 30-yard pass into the end zone. Hit as he let go of the ball, the senior quarterback found Dre Williams over the middle to give the Wildcats a 27-21 lead. The field goal iced the game and Wekiva was unable to score again. THE INFO: The Mustangs forced a three and out by the Wildcats and jumped on offense early in the first quarter. Wekiva quarterback Trey McGee was picked off by Cameron Brown who ran the ball back 42 yards to put the Wildcats up 7-0 less than two minutes into the game. Two drives later, the Mustangs responded in the second quarter. After a muffed punt by Winter Park gave Wekiva strong field position, the Mustangs kept the ball moving. McGee passed it to Wesley Touze at the six-yard line. The very next play, Wekiva running back Jaylon Fair knotted the score at 7-7 with 10:38 left in the first half. The Wildcats caught the special teams of Wekiva off guard and executed a perfect onsides kick to start the second half. However, the Mustangs held their own and forced a turnover on downs. The defense turned into the offense as the Mustangs drove the ball down the field setting up McGee at the 18-yard line. The quarterback then took the ball himself into the end zone giving his team 14-7 lead at the 5:46 mark of the third quarter. Winter Park, however, did not let up on offense or defense. The Wildcats quarterback found Notre Dame commit Jordan Pouncey who broke free for the 38-yard touchdown. Kevince Brown gave the Wildcats a 21-14 lead near the end of third quarter who tipped the pass by McGee, caught it and ran it home 75 yards to the back of the end zone. Despite two interception returns for touchdowns, the Winter Park defense wasn’t able to completely shut down the run game of Wekiva. Jaylon Fair scored with 9:43 left in the game on a 45-yard rushing touchdown. Fair finished the game with 151 yards and touchdowns. The score was tied 21-21 with less than ten minutes to go. KEY PLAYS OF THE GAME: LeGree found John Hodges on the right side of the field for a huge gain on third and five. Hodges was brought down out of bounds on the Wekiva 30-yardline. The very next play, Legree targeted Andre Williams for the go-ahead touchdown pass with 4:06 remaining in the game. The rest was history. This is Winter Park’s first time to the Regional Semifinals since 2013. STAR OF THE GAME: Not one, not two, but three interceptions were caught by the Wildcats defense, two of which were returned for touchdowns. It’s important to remember, this same defense gave up 35 points to the Mustangs back on Sept. 23rd. The star of the game is indeed the defensive unit and special teams of Winter Park. Two pick-sixes, one returned for 75 yards, and a successful onsides kick, that was the difference from tonight’s game compared to Sept. 23rd. DID YOU KNOW: This was only the second time in school history the Wekiva Mustangs had reached the postseason. Wekiva finishes the 2016 season (7-4, 2-1) and hopes to return back to the playoffs next season. QUOTABLE: “The defense all year long for us has gone out and played great and again they did it tonight. They made some great plays, obviously when you have three picks. The defense has been consistent for us all year, and I am proud of them. This a great reward for them. We won and now we get chance to play next week. We made the plays, got the turnover breaks when we needed them and that made the difference tonight,” said Winter Park head coach Tim Shifflet. WHAT’s NEXT: As I stated above, the season is over for the Mustangs. However, there is more football to be played at Showalter Field for the Wildcats. In the other 8A Regional Quarterfinal, the Timber Creek Wolves, runner-up of District 8A-3, upset the once (9-0) Apopka Blue Darters, now (9-1), in a stunner, 40-39 on the road. The win for the Wolves sets up a matchup between two District rivals, Winter Park and Timber Creek. The two teams, both from the same District, faced off against each other on September 30, a game in which no offensive touchdowns were scored. The Wildcats held on 7-0 over the Wolves behind a pick-six from Jonathan Griffin. However, the playoffs are a fresh start for both teams. Next week, it will be a playoff rematch as Winter Park will host Timber Creek for a spot in the 8A Regional Finals.